Chronic lung diseases like cancer and Chronic Obstructive Pulmonary Disease (COPD) are among the most common causes of death in Europe. They cost the EU over €100 billion a year. These diseases involve changes in the cells within the lungs. Research on lung stem cells could shed light on the causes of such diseases, and may provide the basis for future treatments. Many of the most common lung diseases in Europe, such as lung cancer and chronic obstructive pulmonary disease (COPD), are caused by changes that occur in the cells that make up the lungs. Studies on stem cells in the lungs could lead to new understandings of these diseases and set the basis for future treatments. Lung stem cells are important for initial lung development in foetuses. In addition, recent work suggests that there are many different types of lung stem cells in adults that are important for repairing damage. Different stem cell populations are used by the adult lung depending on the type of damage that it has received. For example, damage caused by flu infection is repaired by a different stem cell to damage caused by inhalation of a chemical. Lung stem cells are present in developing lungs of foetuses and adult lungs, but these cells are not exactly the same. Researchers know there are changes that take place, but little is known about how these cells are different. Some researchers are studying the control mechanisms that determine which lung stem cells will be activated following injury or infection. Researchers are investigating how damage to genes that control the growth and multiplication of lung stem cells may lead to cells that continue to divide, multiply, and potentially becoming lung cancers. Most research on lung stem cells has been carried out in mice, however studies are beginning to examine how previous results relate to human lung cells. Studying how human lung cells function is very difficult in the laboratory because these cells form complex structures and tissues that are not yet possible to artificially replicate in the laboratory. However, recent advances in organoid culture conditions have now been applied to the lung and are allowing some of the behaviours of human lung stem cells to be investigated. Why study lung stem cells? 1. The conducting airway tubes, including the trachea, bronchi, and bronchioles. 2. The gas exchange regions, or alveolar spaces. Scientists have discovered that these regions each contain unique types of stem cells and progenitor cells. In normal lungs, progenitor cells are present in abundance throughout each region. These cells divide to replace old or damaged lung cells, which keeps the lung healthy. 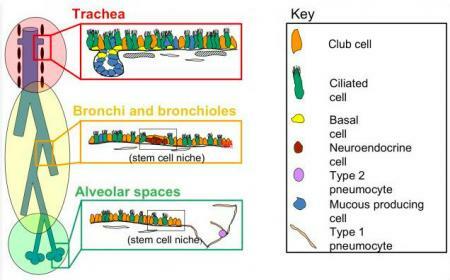 The progenitor cells include tracheal basal cells, bronchiolar secretory cells (known as club cells), and alveolar type 2 cells. Division of these progenitor cells is thought to be sufficient to renew the lung's structure throughout normal adult life. Stem cells are much rarer than progenitors, but they are found in both embryonic and adult lungs. Some stem cells contribute to initial lung development and others help repair and regenerate the lung throughout life. Problems with stem cells may contribute to lung diseases. In mouse lungs rare stem cells have been discovered that are located in the conducting airway tubes, in response to severe injury (e.g. flu infection) these cells can divide and produce new cells that contribute to both the airway and gas exchange regions. These cells have also been grown in vitro and used as a proof-of-concept treatment in injured mouse lungs. A better understanding of lung stem cell and progenitor cell biology will improve our knowledge of how the healthy lung works. This in turn will shed light on the causes of lung diseases such as chronic obstuctive pulmonary disease (COPD). Such research could lead to the development of new drugs or other treatments. Lung stem cells themselves may also be used in future therapies to repair or regenerate the lungs of patients with severe lung damage or disease. Lung stem cells have most frequently been identified and characterised in genetically modified mice. 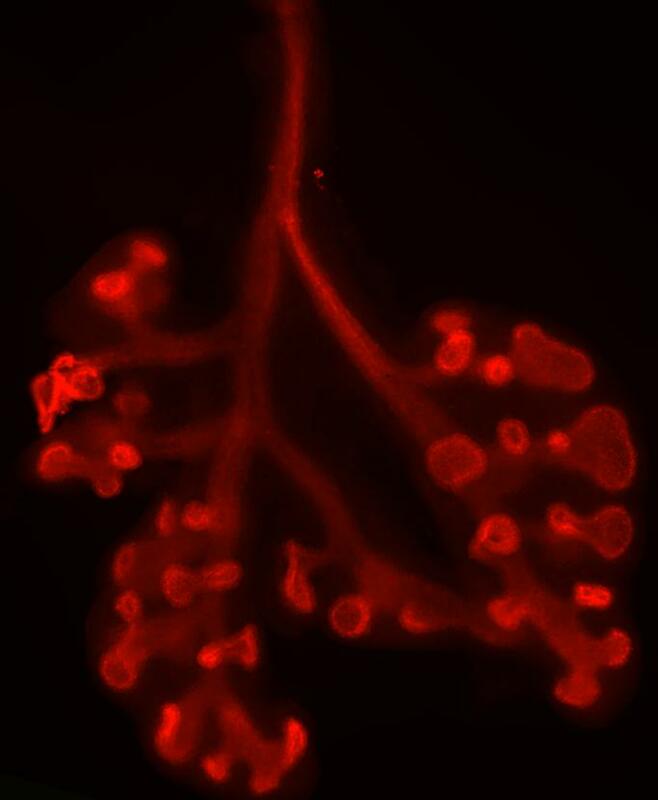 These mouse studies have allowed researchers to identify the differences between embryonic and adult lung stem cells, discover the role of stem cells in lung repair and investigate how changes to lung stem cells may lead to lung disease. A current focus of research is testing if the same stem and progenitor cell populations can be identified in human lungs. In addition, researchers are working to determine the role of stem cells in various human lung diseases, including cancer and COPD. They have also begun exploring potential clinical applications with several ‘first-in-human’ studies to investigate whether lung stem cells might improve organ replacement or regeneration in patients. As scientists improve their understanding of the exact identity and function of human lung stem cells, the potential for clinical applications will be revealed. Researchers will identify drugs that control lung stem cells and can be tested as treatments for lung diseases. Further research will also investigate the uses of lung stem cells for personalised medicine. This factsheet was created by Adam Giangreco and Emma Rawlins. Reviewed and updated in 2015 and 2018 by Emma Rawlins. Diagram by Adam Giangreco. Images by Adam Giangreco and Emma Rawlins. Adult lungs have a total cell surface area of 70m2 - that’s as big as half a tennis court.